Providing cash flow solutions, invoice factoring, and payroll funding to businesses in: Western PA, Ohio and West Virginia. 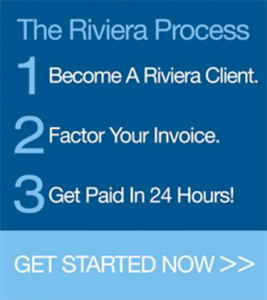 Riviera Finance is an invoice factoring company providing the following services for companies throughout Western Pennsylvania, Ohio and West Virginia. This brand new company started business this year with five trucks servicing some major oil and gas companies. They chose to work with Riviera since their inception because of our personal service and local staff. With Riviera’s cash flow assistance, they are expanding their business and are on track to add 15 more trucks by the end of the year. A young entrepreneur landed a large purchase order from a major distributor. While it was quite the accomplishment, he needed financial assistance in order to fulfill the order. Riviera was able to provide him with a complete solution. We helped secure PO financing, provided by our sister company, which paid his overseas supplier for the finished goods. After those goods were delivered to the distributor, we factored the invoice, providing this young company with operating capital.